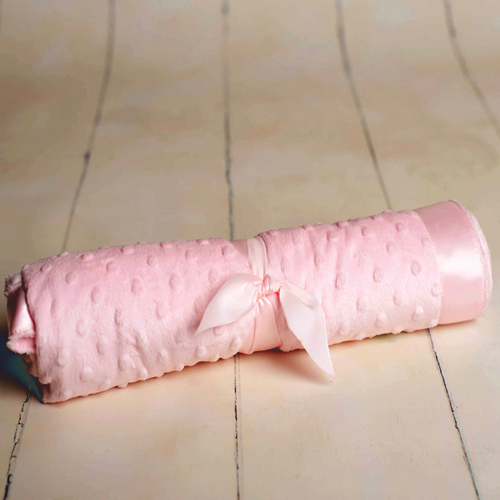 These super-soft blankets are one of our Best Sellers and sure to be anyone's favourite! 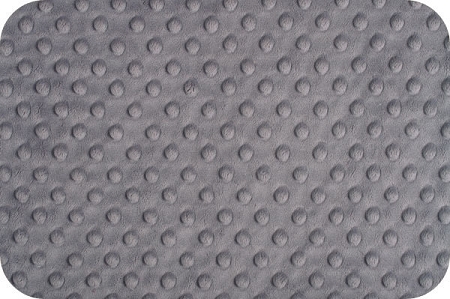 These blankets are the softest you will ever feel. They will keep your Little One warm or cool, as they are lightweight with a luxurious breathable fabric. Each one is trimmed with a stunning satin border. 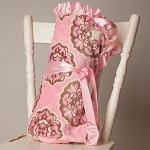 This blanket is reversible with an ultra soft velour/dimple fabric on one side and lined with chenille or dimple fabric on the reverse. 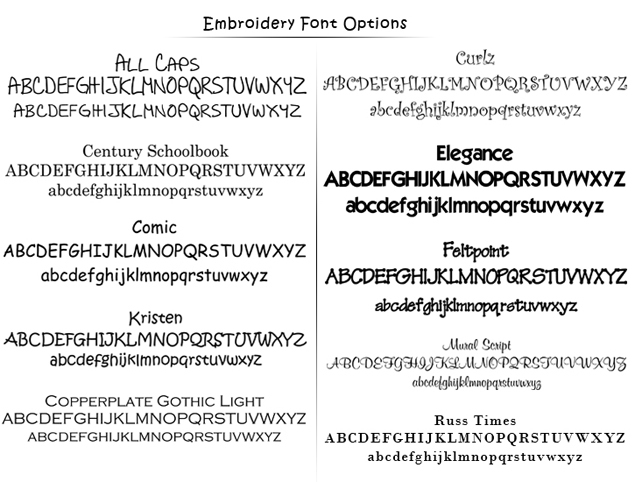 If you want to add a more personal touch they are fantastic to embroider and look even more beautiful when finished. They measure 30" x 40", and these blankets have a matching robe which is just as beautiful. Our Dimple Collection,is not only warm and nurturing, they are durable, long lasting and fabulous; they are chic, luxurious, soft and cuddly. Our line, whether blankie, blanket or robes are great for lounging around, sleeping, strolling, or drying yourself off after a nice bath, even after a swim. In the event the item colour you have selected is not in inventory we will let you know via email, as it may take 2-4 weeks for delivery. Otherwise, if we have it, depending on embroidery you should receive your item within 7 to 10 days. 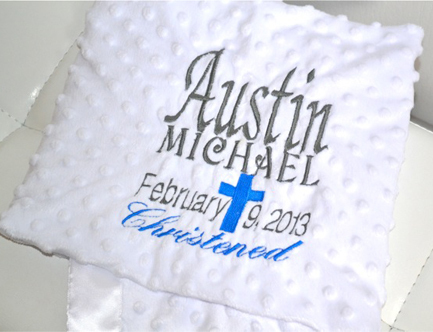 Should you choose to purchase the matching robe and wish to have it embroidered, please select to purchase it in the 'Minky Robes' section located in the robes category, as the embroidery option in this selection is strictly for your blanket purchase. Currently only Blue and Pink have satin trim, grey and white no longer have satin trim. These are made with 100% Polyester (Exclusive of Trim). Machine wash on gentle cycle, do not bleach and hang to dry. 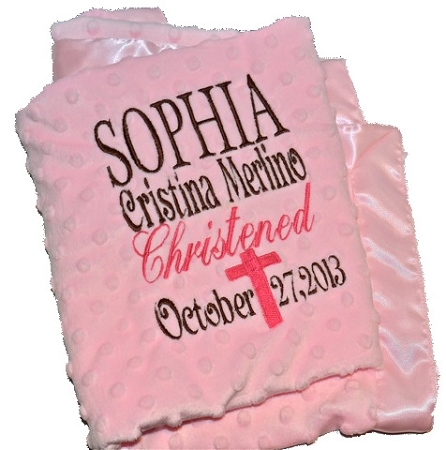 I found Signature Little Ones online as I was looking for that " perfect" baby gift for my niece. I found IT! The Dimple Dot blanket turned out so beautifully and Patricia was so involved and helpful with the planning of all the details with me. Thank you Patricia! Your customer service is excellent! I received the blanket and it is perfect. Thank you so much! !